Already early in the race a breakaway of seven formed including our birthday girl Cecilie. They gained a lead of 3.35min going into the Muur the first time. After 80km Giant-Liv started working to close the gap and was soon joined by RaboLiv. The peloton split in two and the breakaway got reeled in after the strong efforts in the peloton. Going over the second last climb, the Cote de Cherave, the decisive move went away with five riders. In the final climb to the finish, the Mur the Huy, Anna van der Breggen (RaboLiv) proved the strongest securing her second win in a row ahead of Evelyn Stevens (Boels Dolmans) and Megan Guarnier (Boels Dolmans). Our Lauren was in a top ten position behind the breakaway going in to the Mur, but got caught in a crash with 500m to go. She found herself out of position to secure her fourth top ten in a WWT and eventually finished 27th with Tatiana in 33rd after working hard for the team. Our next race is this upcoming weekend at the EPZ Omloop van Borsele Saturday and Dward door de Westoek Sunday. 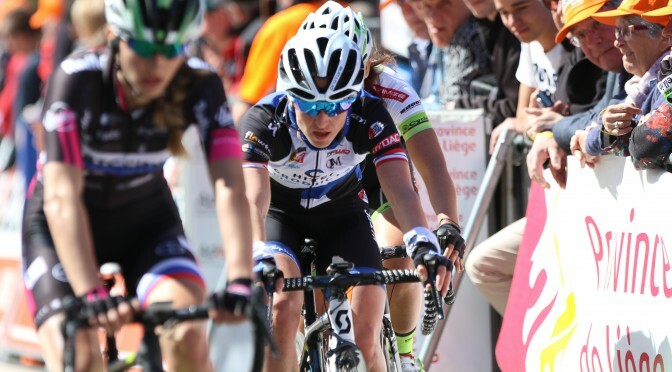 Last year Kirsten won the race in Borsele, but will not be on the start. We will be there with a strong team ready to defend in Kirsten’s absence. Team for the upcoming weekend: Emilie, Lauren, Tatiana, Vita, Julie & Thea. On Sunday Miriam steps in for Lauren.